I’ve been meaning to share this post with you for a while, but things have been crazy busy around here. Between work, the girls’ social schedule, and other happenings around town, I’ve hardly had a chance to catch my breath. Mexico City was simply amazing. I’ve always been totally enamored with this cosmopolitan metropolis, but this visit was so refreshing in so many ways. Although recent travels have taken me to other cities and resorts in Mexico, it had been about five years since I had been to Mexico City and a lot has changed in that time. The city is clean, safe, and new roads and bridges are creating new links between heavily traveled areas of town. I visited the historic center of Mexico City, the Zocalo, where many of the capital’s most important attractions are found. The National Palace is the official place where the president often conducts business and is a stunning landmark in the main square of town. 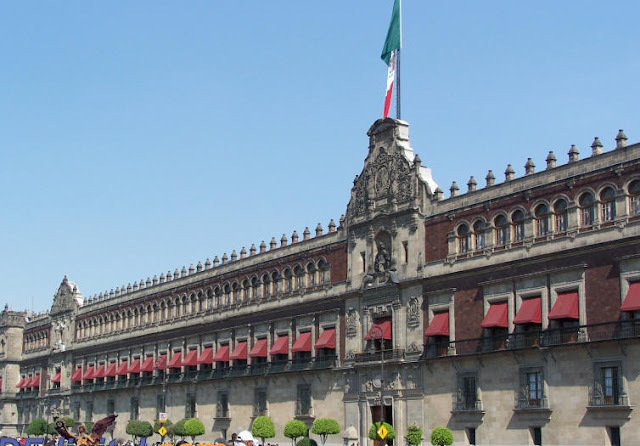 The highlight of the visit to the National Palace is the collection of stunning Diego Rivera murals that beautifully illustrate Mexico's history. This amazing mural occupies an entire stairwell and multiple levels of the building. The detail is incredible and you could spend hours examining each expression and panel of the work. Another series of murals can be found along the corridor of the second floor of the National Palace. My favorite panels tell the story of the people living in Mexico when the Spanish arrived. The market scene and details of everyday life seen in the murals tell stories that would fill volumes of historical books. Here's one of my favorite vantage points at the Palacio Nacional. The Plaza de Armas is impressive and beautiful. I love colonial Spanish architecture with a central plaza or open area. I spied this plant behind the Palacio Nacional and am intrigued by the black volcanic rock that is found everywhere throughout Mexico City, particularly in neighborhoods in the southern part of the city like Pedregal. The Catedral Metropolitana is located just on the other side of the main square from the Palacio Nacional. When the Spanish arrived, in an effort to convert the indigenous people to Catholicism, they built their churches and cathedrals on top of existing religious buildings, pyramids, and structures. Often the same stones were used in this construction. The Metropolitan Cathedral is built on top of a former sacred Aztec area near the Templo Mayor. Unfortunately, the church is slowly sinking into the unstable ground that is largely affected by frequent earthquakes. From the right angle, the church appears to be sinking on one side! I love the cherubs and ornate floral designs on the entrance to the tabernacle. I could spend hours sharing details about these incredible buildings and other amazing sites in Mexico. I'm a bit of a history nerd and actually earned a Master's Degree in Art of the Prehispanic and Viceroy period while I was living there. Art in any form is so inspiring to me. On a practical note, if you visit the Palacio Nacional, entry is free of charge, but do be prepared to show a photo id. You'll also need to check bags with candy, gum, markers, and a somewhat lengthy list of harmless looking items. I paid 10 pesos to leave 2 pens, a pack of gum, and hand sanitizer in a bag check before entering the building. Go figure. Who knew that gum was a no-no? Bare shoulders and legs for women are discouraged if you decide to visit the Metropolitan Cathedral, although the dress in Mexico City is somewhat conservative in general. No short Lilly shifts for touring in the center of Mexico City! I love Rivera's works, they're so intricate! So beautiful! I have really enjoyed these posts - thank you for sharing with us!